NOTE: the program will begin on the morning of October 31st . (Check-in time at the hotel will be 2:00 p.m. on the October 30th- check out will be 1:00 p.m. on the November 8th) We advise arriving some time in advance, to get acclimated before the program begins. This cost includes a non-refundable registration fee of $300, all accommodations and meals for 9 nights, all transportation and honoraria during the visit. It does NOT include airfare, transportation to and from the airport, personal expenses and souvenirs, or travel insurance. PLEASE NOTE THAT THIS IS A RIGOROUS TRIP THAT INCLUDES CLIMBING OF STAIRS AND MUCH WALKING, SOMETIMES OVER ROUGH TERRAIN. Sabeel Witness Visit trips provide participants with the unique opportunity to experience the reality of Palestinians living under Israeli Occupation. This includes, but is not limited to, visiting: the Separation Wall, illegal settlements, checkpoints, confiscated and demolished homes, and refugee camps. 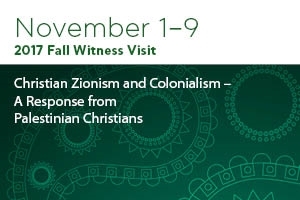 Participants will be able to learn firsthand about the loss of civil and property rights of Arab Israeli citizens, as well as see for themselves both the past and present violations of international and humanitarian law. 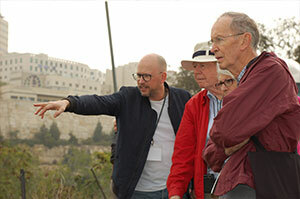 Participants will have the ability to worship, meet, and reflect with local individuals and families living in the Holy Land. This includes Palestinian Christians and Muslims, Jewish Israelis, and also internationals who partner with Sabeel to non-violently resist the illegal occupation. 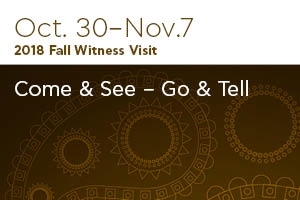 Each Witness Visit trip is unique: themed delegations will have lectures and experiences pertaining to a specific theme, which will amount to about 20% of the overall trip content. The primary emphasis of each trip is to explore the social and political realities in the region, which are dynamic and evolve on a daily basis. Delegates will also discuss how the conflict affects Israeli society, and will hear from local Israelis on this subject. All of this experiential learning is intended to motivate participants to become agents of change when they return home. Therefore, Sabeel also provides materials, support, and mentoring to help returning delegates make connections to their local communities and to share what they have learned while here. NOTE: the program will begin on the morning of March 1st. 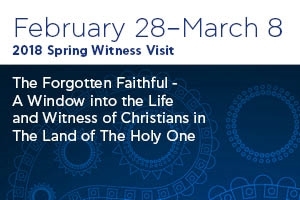 (Check-in time at the hotel will be 2:00 p.m. on the February 28th- check out will be 1:00 p.m. on the March 9th) We advise arriving some time in advance, to get acclimated before the program begins. NOTE: the program will begin on the morning of November 2nd. (Check-in time at the hotel will be 2:00 p.m. on the November 1st check out will be 1:00 p.m. on the November 10th) We advise arriving some time in advance, to get acclimated before the program begins. NOTE: the program will begin on the morning of November 3rd. 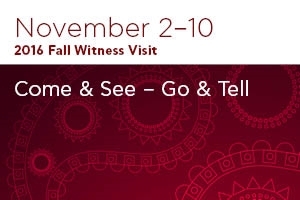 (Check-in time at the hotel will be 2:00 p.m. on the November 2nd- check out will be 1:00 p.m. on the November 11th) We advise arriving some time in advance, to get acclimated before the program begins.